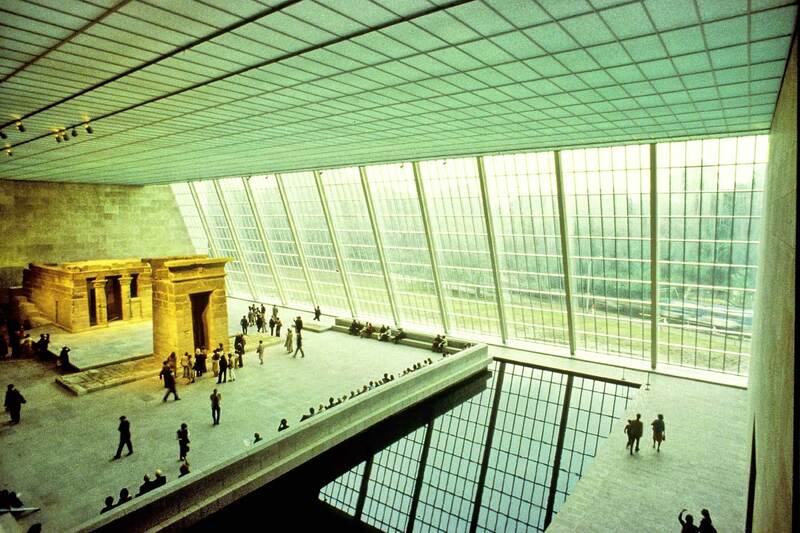 Temple of Dendur in the Sackler Wing of the Metropolitan Museum of Art, New York, New York, 1979. Courtesy Kevin Roche John Dinkeloo and Associates. Kevin Roche (b. 1922) is one of the profession’s most decorated practitioners, having captured a grand slam of architectural accolades: the Pritzker Prize (1982), and the American Institute of Architects’ Gold Medal (1993), Firm Award (1974), and Twenty-Five Year Award (1995, for the Ford Foundation Headquarters). This exhibition explores how the founding design partner at Kevin Roche John Dinkeloo and Associates (KRJDA) has approached and solved design challenges for the nation’s leading corporations and institutions from IBM, Union Carbide, and Merck to the United Nations, the Ford Foundation, and the Metropolitan Museum of Art. In addition to images, drawings, and models, the exhibition features interviews with Roche and original slide presentations prepared for various clients. First recognized as Eero Saarinen’s right-hand man, Roche came into his own in the 1960s and quickly established himself as a big-picture thinker. He adopted an expansive definition of architecture which encompassed civic concerns such as transportation, infrastructure, and public space, as well as the broader economic and cultural landscape. His mastery of systems theory, applied to architecture, was especially appealing to corporate America. Kevin Roche: Architecture as Environment is organized by the Yale School of Architecture. Additional Support for the exhibition is provided by the Graham Foundation for Advanced Studies in the Fine Arts, Carolyn Brody, Property Group Partners, Elise Jaffe + Jeffrey Brown, and an anonymous donor.